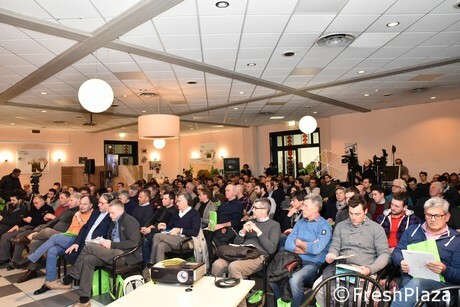 On the 23rd January 2019, the technical conference held in Faenza attracted more visitors than expected. 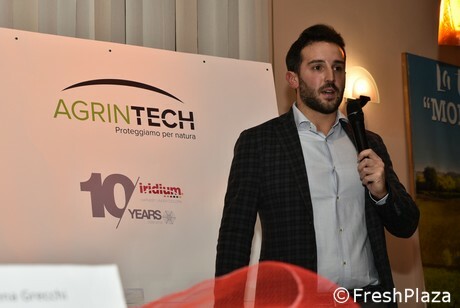 The massive crowd that participated in “Iridium 10 years: Technical solutions for precision fruit farming” was a demonstration of the huge interest that companies have regarding technical innovations. 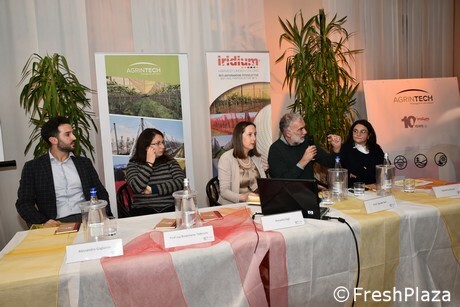 As the organisers pointed out, the conference occurred at the right time (the Iridium 10th year anniversary) and in the right place (Faenza is located in Romagna, the heart of quality fruit farming) in order to be this successful. 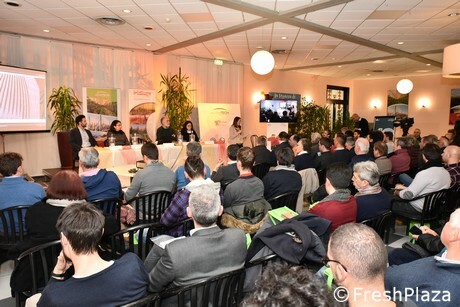 The Agrintech company organised the event in collaboration with agrarian experts from Ravenna, Forlì-Cesena and Rimini, and with the BCC bank. This occasion marked the tenth anniversary of the Iridium branded photo-selective anti-hail net protections. Lucio Ragazzini welcomed the audience. He is the agriculture manager for BCC and he showcased the activities and the tools that the bank provides the companies with. Alessandro Gagliardo described how the company in Eboli has tailored its innovations to companies’ needs, over ten years. In 2009, they had the idea of focusing on some important aspects of successful farming, “We wanted to know if it was possible to use light for crops in a more efficient way. Soon, we realised that this was still uncharted territory”. The company involved many institutions in its research such as the Polytechnic University of the Marche, the DISAFA of Uni Torino, Agrion, but also foreign associations. The goal was to better understand the role of the light – and of specific wavelengths – in important aspects of plants’ life: from the photosynthesis and the fruit colouring/ripening to the size, the Brix degree, the dry substance and the preservability. 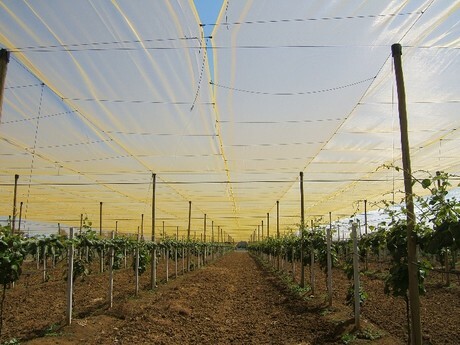 As of today, the use of anti-hail net protections of different colours is widespread, involving different crop varieties and opening new research opportunities regarding the nets’ mechanic properties. For instance, they could be used as wind protection or as humidity or sun protection, but also as a defence against harmful insects. Starting from 2014, Iridium net protections have been used over more than 1.300 hectares, especially on quality or niche produce. Gagliardo explained, “Our goal for the future is to include these protections within a green economy. In this way, their end-life will become a new beginning so not to produce waste”. The conference revolved around two phases: one for technical reports, and the other for interventions and discussions supported by technicians and operators. 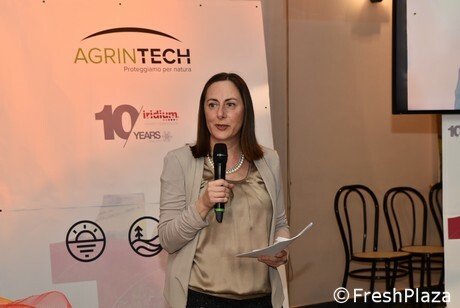 The researchers who worked together with Agrintech for the analyses and on-field tests participated in the conference as special speakers. The table of the speakers. From the left: Gagliardo, Tedeschi, Gigli (moderator), Neri and Grecchi. 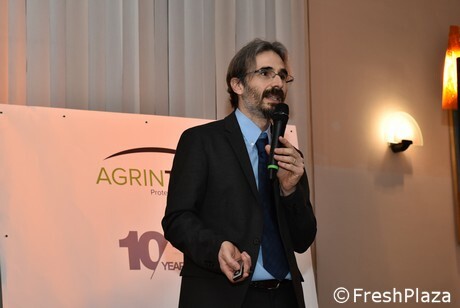 Prof Davide Neri of the Agrarian Science Department of the Marche Polytechnic University illustrated the light variations under photo-selective protections in terms of quality and quantity. 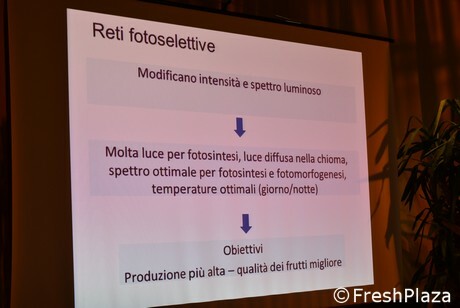 Starting from a wide light spectrum, the professor indicated the most important wavelengths not only for the photosynthesis but also for photo-morphological aspects. In other words, the light – depending on the wavelength – affects the shape of the plants (height, branch number, vegetative state, and so forth). The coloured protections showed interesting anti-UV and anti-burn effects, but they can also be used to obtain a better light diffusion (as the pearl-coloured ones, for instance). 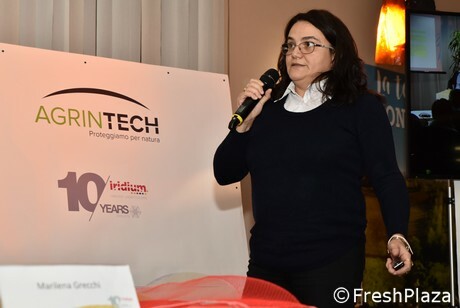 Prof Rosemarie Tedeschi of the Turin University (DISAFA Department) illustrated some experiments conducted in North Italy regarding the use of Iridium photo-selective protections for apple and peach trees. 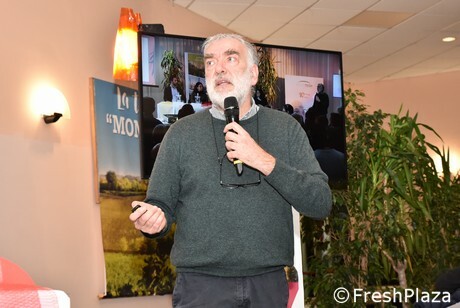 The professor explained the different modes of application of the protections: completely closed if they include the soil, or not completely close if they exclude it. Additionally, the academic pointed out the different parameters taken into consideration for the research such as the mesh dimensions, the type of texture and the colour. The results were really interesting: as expected, the protections drastically reduced the presence of harmful insects compared to a fruit orchard that was not treated with chemical or organic remedies, but they were also more effective than chemical products used in standard conditions. 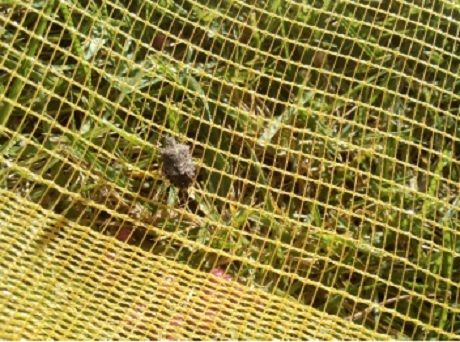 The research - funded by the EU Life-Susafruit project - opens further opportunities for the study of net protections' harmful effects on dangerous insects (shield effect excluded). 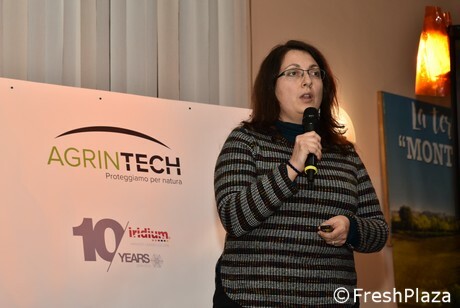 Last but not least, Marilena Grecchi (on behalf of the Gabriel-Chemie company which produces additive masterbatches and colours for plastic materials) illustrated the photo-selective anti-hail nets master production process. The quality requirements for the colouring proved to be very interesting as it must preserve its properties even in conditions of long-term UV-rays or chemical substances exposition. A few people intervened from the audience and pointed out how not all the net protections available preserve their colour, which oftentimes fades – differently from the Iridium’s nets. That is why it is extremely important to rely on a high-technical-standard master production process which is tailored to the customers’ needs.